Marco On The Bass: A Movie About A Vampire Rude Boy With A Ska Soundtrack By Neville Staple Of The Specials? 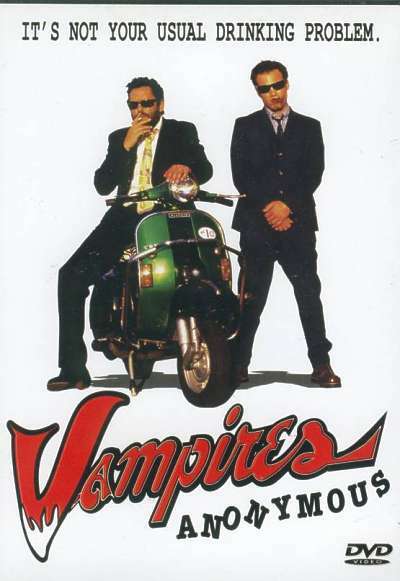 A Movie About A Vampire Rude Boy With A Ska Soundtrack By Neville Staple Of The Specials? In honor of the Academy Awards tonight, I wanted to do a quick ska-related movie post about 'Vampires Anonymous'. Its an enjoyable B-movie that takes a comedic look at the vampire genre that may have escaped your attention when it was released in 2003. The plot centers around a vampire named Vic Weller (I kid you not!) who during a moment of clarity after draining his latest girlfriend, realizes that he wants to give up the vampire lifestyle, and admits he has a problem. He contacts Vampires Anonymous and they set him down the twelve steps to a normal lifestyle. 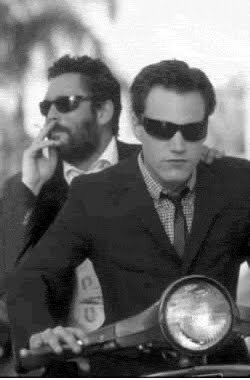 He is given a sponsor, played by a bearded Michael Madsen (Mr. Blonde from 'Resovoir Dogs') and relocates from California to North Carolina. The movie deserves a second look from ska fans based on a few key ska related details. First, the vampire protagonist Vic wears pegged pants, Ben Sherman shirts, a maroon flight jacket, skinny ties and a pair of two-tone Spectator wing-tip shoes. He also drives a modified P200 Vespa with crash bars and lights! He's a reluctant rude boy vampire! Staple's songs with The Hitmen on the 'Vampire Anonymous' soundtrack are a mix of 2-Tone flavored ska-punk, heavy on the horns and distorted guitars with Staple's unmistakable baritone. Its clear from the sound of the songs that Staple had really soaked up the the California ska sound of the late 90's. Staple and The Hitmen prominently featured during the 2000 Van's Warped Tour. Have a listen to the the three songs from the movie soundtrack below. The three songs were later included in an unreleased solo album Staple recorded with The Hitmen in 2001 that has been floating around the Internet for a few years now. Titled 'Neville Staple From The Specials' the album features a total of 16 songs that were recorded in Costa Mesa, California and Coventry, England. Staple later used The Hitmen to re-record a number of songs by The Specials which was billed as 'The Specials Greatest Hits' that was released in 2006. Not surprisingly the CD received less than stellar reviews! Enjoy the Oscars! Holy Balls is this 'Neville Staple From The Specials' album completely amazing!!! I don't know how I ever missed this, but thank you for pointing me in the right direction. Anyone have a new link to 'Neville Staple From The Specials' they can share, struggling to find it online anywhere.